Attackers in Afghanistan have sprayed acid in the faces of at least 15 girls near a school in Kandahar, police say. They say the attack happened shortly before at least six people were killed in a bomb blast near a government building in the city. Doctors say the six girls were wearing Islamic burkas or veils which provided them with some protection. Correspondents say the attack is likely to have been carried out by those opposed to the education of women. A spokesman for the Taleban denied involvement in the attack. The former Taleban government - ousted from power in 2001 - banned girls from attending school. 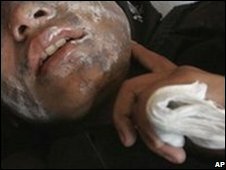 "We were going to school on foot when two unknown people on a motorcycle came close to us and threw acid in our faces," 16-year-old Atifa told the BBC. "I want to ask the government why they cannot protect us, we girls want to study but the government is not helping us. We want better security." She said the attack took place on Wednesday morning outside the Mirwais Nika Girls High School. Officials say that two attackers used a toy gun to spray the acid and fled as soon as people came to the assistance of the girls. Atifa said she did not know why anyone would have attacked her and the others. "I don't know why they did it," she said. "Kandahar is not safe. But we can't stay at home, we want an education." The BBC's Ian Pannell in Kabul says the incident has shocked ordinary Afghans. Nato-led forces in Afghanistan condemned the attack as cowardly.